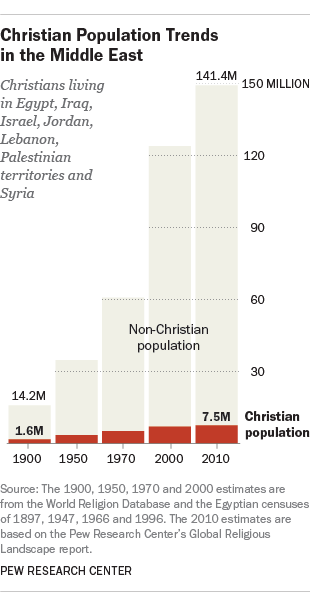 Between 1900 and 2010, the total number of Christians in the region – including Egypt, Iraq, Israel, Jordan, Lebanon, Syria and the Palestinian territories – grew from 1.6 million to 7.5 million. But while the Christian population in the Middle East more than quadrupled in that period, the non-Christian population increased ten-fold. As a result, the Christian share of the overall population in the region decreased from 10% in 1900 to 5% in 2010. In recent decades, Christians in the region have tended to be older, have fewer children and be more likely to leave the area compared with Muslims. Since 2010, there has been considerable population change in the region due to war in Iraq and Syria, hostilities in other countries and related migration, but there is little reliable data to measure overall regional shifts in the last few years. Many Christians have left Iraq in recent years, though many stayed in the Middle East, fleeing to neighboring countries such as Jordan. Pew Research has found rising social hostilities related to religion in the region since 2007. Christians faced religious harassment in a greater share of countries in the Middle East and North Africa than in any other region in 2012 (the most recent year for which data are available). Most of the Christians in the Middle East (65%) are Orthodox Christians, including members of the Coptic Orthodox, Greek Orthodox and Syriac Orthodox churches. Catholics are a minority among the overall Christian population in the Middle East (27%), with slightly more than 2 million people. The rest of the Christians in the region are Protestant (7%). Egypt has the largest Christian population in the Middle East, according to Pew Research estimates, which are based on Egyptian censuses. Leaders of the Coptic Orthodox Church in Egypt claim a much higher number of Christians in Egypt than are seen in Egypt’s census.